Do you want to be music? Did you ever dream of making music but thought you weren't good enough, didn't have the right gear, didn't know the right people, were too stage-frightened, or maybe you just keep putting it off? Are you an avid musician who wants to try a new sound or new instrument? Do you want to have fun and meet new people, and support your comrades? If any of the above are true, MYSTERY BAND is for you! And MYSTERY BAND is for Santa Cruz! Anyone can make music. Really! Even if you are going on vacation or traveling for a bit, you can probably work it out with your band-mates. ANYONE CAN DO MYSTERYBAND. If you are terrible, people will still love you. Forward this to everyone you know, please. DEADLINE has been extended to Monday, July 19. People with basically no musical talent, some musical talent, or a lot of musical talent, throw your name into a hypothetical hat to get placed in a band with 4-5 other people. You will receive a band roster in the next few weeks. Then you'll have 6 - 8 weeks to come up with 20-30 minutes of original music. After 6 or 8 weeks, some time in September, watch your comrades as they brazenly play their INCREDIBLE MUSIC you never even imagined was possible! and if you are willing to be the bottom-liner for your band (this only means you contact band-mates after you get your band roster to schedule the 1st practice, and also are the communicator with me for the showcase at the end of summer). 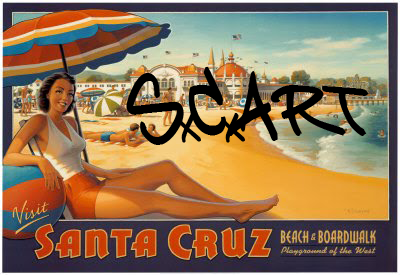 OK so DO IT SANTA CRUZ! It's so fun I promise!